The popular spice may help regulate blood-glucose levels. With holiday favorites like pumpkin bread and spiced cider on the menu, recent research in the American Journal of Clinical Nutrition provides welcome news: cinnamon may help you better regulate your blood-glucose levels. In a study of 14 healthy people, scientists at Malmö University Hospital in Sweden gave half the subjects rice pudding mixed with about 3 teaspoons of cinnamon; the other half got an unspiced version of the dessert. Then, they switched: each group tried the opposite pudding. Both times, up to two hours after eating, the people who’d enjoyed the cinnamon-spiced pudding measured significantly lower blood-glucose levels than those who’d eaten the unspiced one—an indication that their blood sugar was moving more efficiently into cells, where it’s used. Eating the spiced pudding also appeared to slow the movement of food from the stomach into the small intestine (a part of digestion called “gastric emptying”). Though researchers don’t know exactly how cinnamon slows digestion, the fact that it does may, in part, explain the lower blood sugar. “When food enters the intestine more slowly, carbohydrates are broken down slower, which leads to a lower [post-meal] blood-glucose concentration,” says the study’s investigator, Joanna Hlebowicz, M.D. Other studies suggest that the spice also may improve blood-glucose levels by increasing a person’s insulin sensitivity, the ability of cells to respond to insulin’s signal to move glucose out of the blood. One 2003 trial of 60 people with type 2 diabetes reported that consuming as little as 1 gram (about 1/2 teaspoon) of cinnamon daily for six weeks reduced blood-glucose levels significantly. It also improved the subjects’ blood cholesterol and triglycerides—perhaps because insulin plays a key role in regulating fats in the body. But other work disputes these findings. 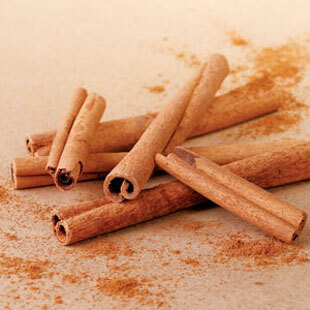 A 2006 study showed that insulin sensitivity in diabetic women taking cinnamon supplements did not improve. Why the discrepancy? It could be because the study examined only a specific population: postmenopausal women, many of whom were taking a variety of glucose-lowering medications (which wasn’t the case in the other studies), say the authors. Bottom line: Sprinkling a 1/2 teaspoon of cinnamon on your oatmeal in the morning can’t hurt, it’s tasty and it just may, over time, help ward off diabetes. But don’t go overboard. Animal studies suggest that a compound in cinnamon called coumarin may be toxic in high doses (although humans may not be as susceptible). Cinnamon oils are particularly concentrated, so steer clear. And if you have diabetes, don’t try cinnamon supplements without talking with your doctor: combining them with a prescription medication may be dangerous.